Its 2012 Mid Year Goal Review time already, SO UNBELIEVABLE. Time flies. The emergency fund and the small girl's bursary that I give are the highlights of the past semester. I had 2 bad months and the rest of the time I was a great girl. I will actually revisit my goal setting. I don't think I need most of the goals I have here anymore. Blogging makes it so much fun trying to keep on to my goals. Remodel the duplex that we have put off the market. Prepare that property for rent by the end of 2012, when we no longer need to use it. Remodel the bathroom in a two bedroom property. 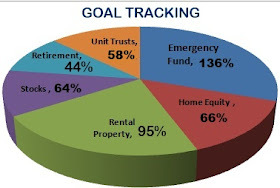 Push for 70% equity on our home by December. Get stocks to 55% of the current target. This is the most important personal finance goal for me. All my wealth growing energies are on this in 2012..
Visit my parents for at least 2 weeks. Get training in some media form. This can be online. Finish all my unfinished home and craft projects. Have fun whilst doing it all. INDEED I AM HAVING LOTS OF FUN.